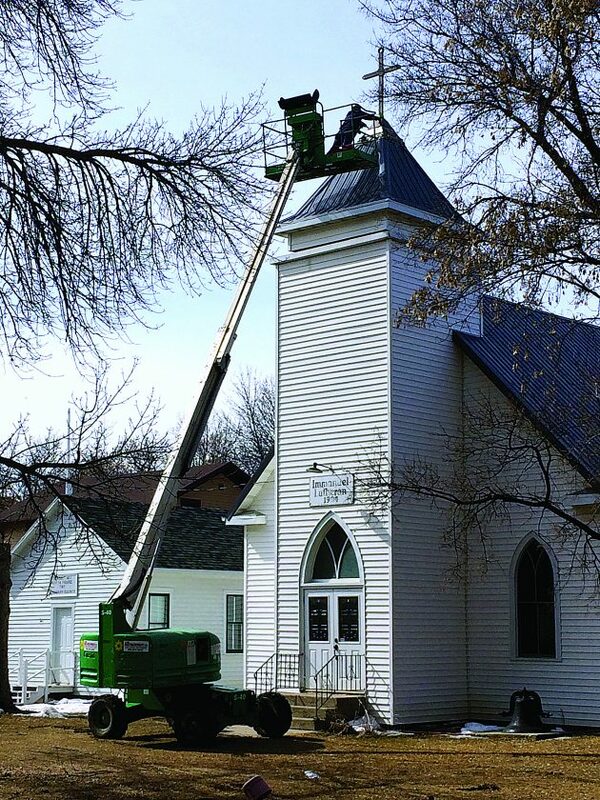 Submitted Photo LEFT: A cross is removed from the Lutheran church on the grounds of the Ward County Historical Society’s pioneer village on the North Dakota State Fairgrounds. All of the buildings must be relocated to Burlington by June 15. The State House voted 73 to 17 on Monday to give final passage to a bill that will provide funding to relocate the Ward County Historical Society’s Pioneer Village from the North Dakota State Fairgrounds in Minot to its new home in Burlington. The bill appropriates a combined $250,000. According to the language in the bill, $150,000 is to come from the general fund of the state treasury and another $100,000 is to come out of the State Fair Association’s operating fund. The money from the State Fair would be granted contingent upon certification that all of the buildings have been moved off the state fairgrounds by June 15. The amended version of the bill reduces the general fund appropriation for a grant from $450,000 to $150,000. The initial version of the bill would have provided up to $2 million for the move. However, Ward County Historical Society President David Leite said the board is “elated” that the bill has passed and he thanked Rep. Randy Schobinger, R-Dist. 40, for keeping the bill alive by amending it and said the historical society is grateful for the help from the legislature. “The vote was 73 Representatives in favor with only 17 against, showing that our cause is seen favorably throughout the state,” Leite said in a press release. The State Senate must also vote again on the final version of the bill, though Leite is hopeful that it will pass without any problems. The historical society lost a long running legal battle last year to keep the museum on the fairgrounds after the State Fair Association filed an eviction action. The historical society board decided against an appeal in favor of relocating to donated land near Burlington. The organization has plans to grow and expand the museum in the new location.